1. Open iTunes on your computer. If not installed, download from www.itunes.com. This tutorial is optimised for iTunes 11. 2. Plug in your iPad with the USB cable. The first time you plug in your iPad it will take a while to install. 3. Just click the red cross in the upper right corner to close the Window. 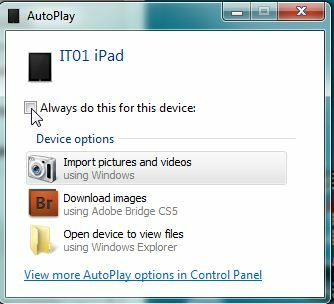 If you would like this message removed permanently, please follow the “Remove AutoPlay” How-to. You will know iTunes is ready when the iPad is displayed on the top right hand corner. See below. Click on the name of your device in the top right hand corner. 4. 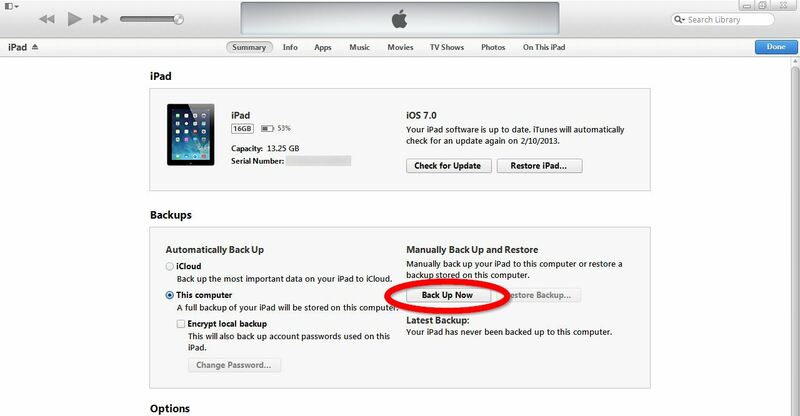 Now in the iPad details screen, click on “Back Up” to back up your device. The iPad details screen displays details about the iPad, as well as the option to back up and restore it. The backup will begin and show a progress bar at the top to let you know when it’s finished. The process may take a while depending on the amount of data stored on the device. A progress bar will appear to indicate the process has begun.